Last week I had the honor of attending Capitol Hill Day with my father in Washington D.C. It was a two-day event sponsored by the Scleroderma National Foundation and myself and my dad along with 30 other patients and caregivers attended. We were asked to meet with congressmen and women to lobby for a bill called The H.R. 4638, to be passed, along with a few other bills that needed co-sponsorship for the 2019 fiscal year. The H.R. 4638 bill is called the National Commission on Scleroderma and Fibrotic Diseases Act of 2017. This bill is needed to help fibrotic disease researchers to come together and study fibrotic diseases as a whole. The bill encourages them to communicate openly with each other to find scientific breakthroughs that could lead to cures. Now, those of you who know me know I am not into policy and political advocacy for scleroderma. To be perfectly honest, I was really feeling nervous and under prepared for what was to come. On the day of, we all loaded onto a bus and drove from our hotel to the Capitol building for a photo of our group, and split up into teams of four to six people, including a group leader who knew where to guide us. Our job as volunteers was to meet with our state representatives and basically pitch the H.R. 4638 bill to them and retry to get them to co-sponsor the bill. We already had 24 signatures of representatives willing to step up to the plate and cosponsor the bill. My father and I met with four New York state representatives’ staff members including one from Brian Higgin’s office. It was a truly amazing experience. The staff members really just wanted to hear our stories and to learn more about scleroderma, which was so awesome. We also met with three representatives from the State of New Jersey including a surprise meeting with the senator of New Jersey. All of the meetings went extremely well, and I am very optimistic we will have more co-sponsors for this bill in the days and weeks to come, and eventually it will pass. I could not have asked for a better trip. I learned so much about the Foundation and how hard they are fighting for research and a cure for this disease. I got to see the political side of scleroderma and how hard people work to get funding and to make scleroderma a household name. I also met amazing scleroderma patients just like me. All of them were kind, inspiring, hilarious and courageous individuals who deserve the passing of this bill so we can tackle this disease and find a cure. I was so nervous about speaking to my state’s representatives, but in the end I just spoke from my heart and experiences living with a rare chronic illness that has no cure, and has changed my entire life. Capitol Hill Day was a tremendous success both politically and personally. I was so proud to represent the scleroderma patient community to lobby for this bill and to promote awareness and change. Anyone living with this disease who is interested in sharing their story and wants to help fight for research and a cure, I 1000% recommend attending the Capitol Hill day trip. 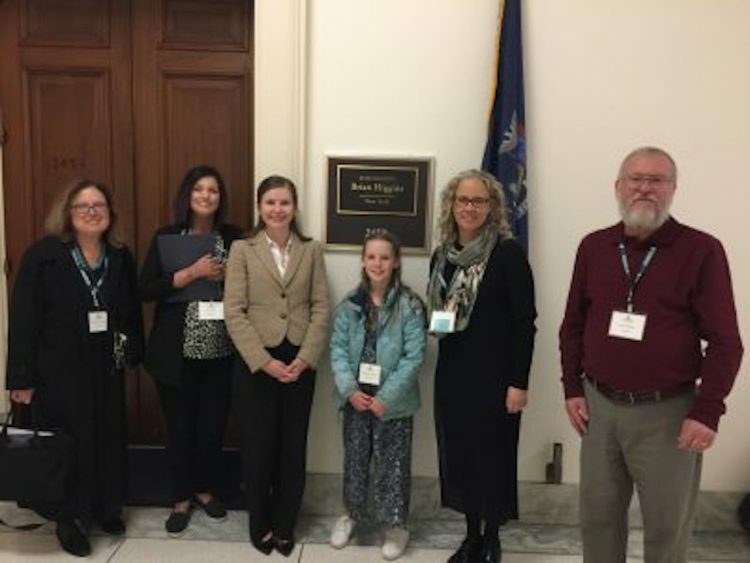 I had a blast doing what I love — advocating for patients living with scleroderma so their voices can be heard. I am currently living in a body that doesn’t really want me in it. I was diagnosed with Systemic Scleroderma 17 years ago. Living with a rare chronic illness is anything but easy or enjoyable but I try to wake up every morning with a positive attitude. I wouldn’t really be here if it wasn’t for my amazing family and friends. They have been by my side since day 1 and support me through good times, bad times, awful times, and please let me just leave this earth times! It has been a dream of mine to be a writer, with the online magazine the Mighty I am able to accomplish that dream by writing very personal articles about my battles. Maybe just maybe someone out there feeling down and out will read my articles and it will lift their spirits. That would mean the world to me. I am also currently heading a Facebook support group for young adults and teen living with Scleroderma and we are called the Scleroderma Super Starz. You can also find me at my own personal facebook page “Staying alive with Scleroderma” or on my blog at “Professional Pincushion in makeup and mittens” on wordpress and twitter.